Blue/Orange is a play that just gets better and better with age. 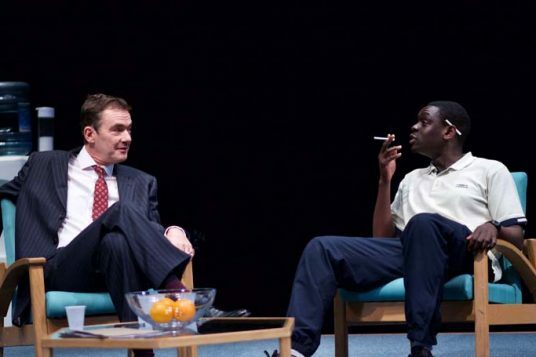 Joe Penhall’s 2000 Olivier-winner is as intelligent and absorbing as ever in this new production at Birmingham Repertory Theatre – a production that introduces two new talents in actor Ivan Oyik and director Daniel Bailey. Oyik, remarkably still training at Guildford School of Acting, supplies a raw, rough but hugely charismatic performance as Christopher, a sectioned young black man undergoing intensive therapy at the hands of a psychiatrist (Thomas Coombes) and his consultant mentor (Richard Lintern). 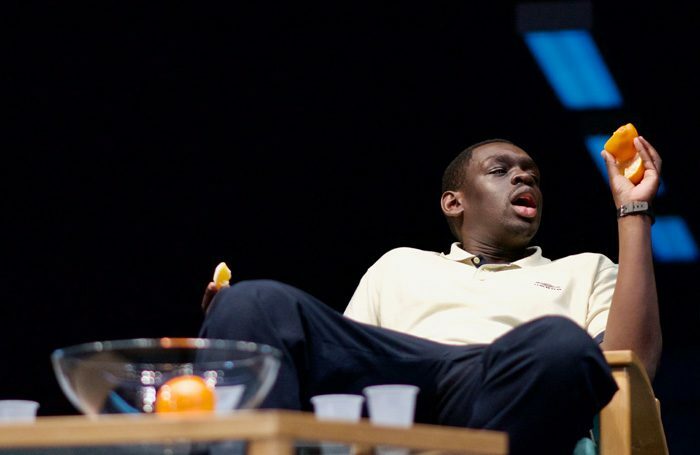 Over three acts and nearly two and a half hours, Oyik’s Christopher is pushed about like a plaything between these two men – at times an object of interest, occasionally a person, but often little more than a pawn in their egotistical powerplays. 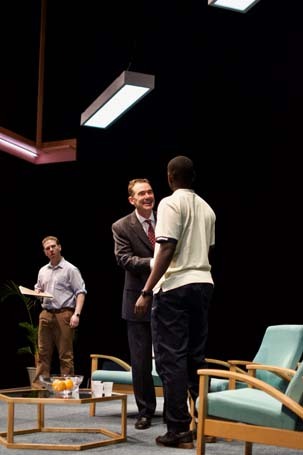 If the play still resonates – and it definitely does – it’s because the issues it tosses around are still piercingly pertinent: the question of ethnocentrism (or institutionalised racism, if you will) in care; the conflict of ethics and practicality in an over-stretched public hospital; our arbitrary understandings of mental health. This revival doesn’t just remind us that Penhall is a first-class crafter of muscular dialogue and psychological insight (fans of his superb Netflix series Mindhunter don’t need telling), it proves that he is, or at least was, a writer of rare prescience too. 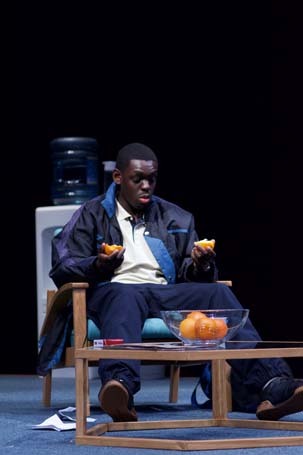 Bailey’s stylish staging – the biggest of his career to date – makes the most of the titular colour scheme: the three actors prowl around each other on an off-kilter square of carpet, a bowlful of tangerines plonked suggestively on the table between them, and a long, wall-less corridor extending out across an infinite blackness behind. It’s cool work from designer Amelia Jane Hankin, and from lighting designer Azusa Ono and sound designer Clive Meldrum, who both underline the psychological warfare with twitchy acuity. 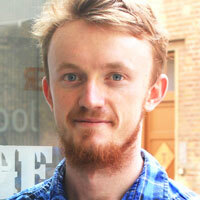 Bailey also draws out three strong performances. 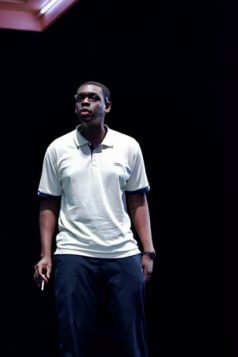 There’s Oyik, veering delightfully and disturbingly between buoyant and dejected. 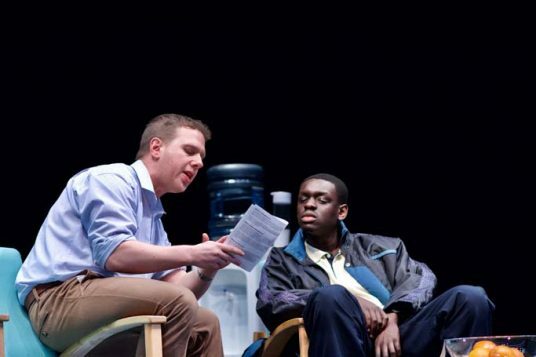 It’s a performance of dexterity, shifting between easy chirpiness and dull-eyed menace. Alongside him, Coombes’ initially earnest psychiatrist is considered and careful until he’s decidedly not, and Lintern’s devilish consultant is genial and chuckling one moment, furious with rage the next. There’s really not much to fault here at all, besides a slight slacking of energy in the second act – the first and final thirds are tightly wound and tense throughout. Smart direction, smart design, smart actors, and smart play. A cracking production of a contemporary classic.